Large-scale, striking table lamp with black glass base embedded with gold leaf. The large top diffuser is available in 3 unique glass styles. Companion floor, pendant and wall designs also available. 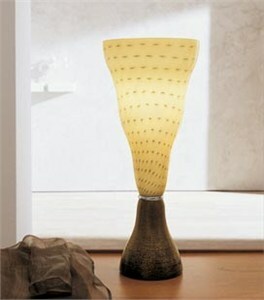 The black glass base, which is weighted, supports the large handblown diffuser. Upward and diffused illumination is provided by the incandescent light source. An on/off switch is provided on the black cord. Ring detail above base: Polished Chrome or Polished 24K Gold Plated. Diffuser: Satin White, Satin Amber, Amber Spotted. Base: Embedded Gold Leaf in Black.